My son is a huge Star Wars fan! If possible, I think he even knows more than his daddy does, when it comes to Star Wars. And that's saying something. Because my son comes by it naturally, my husband is a huge Star Wars fan, too (he's really a bigger Star Trek fan). 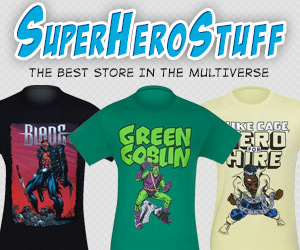 So I'm so excited about finding SuperHeroStuff.com! My dilema is trying to decide which Star Wars T-Shirt to get my son. And while there, I think I might get me some Wonder Woman apparel. If you or someone you know are into Sci-Fi stuff and/or Super Heroes… I'm sure you can find a great gift here!